Need a New Roof with Excellent Protection Against Heat and Cold Transfer? National Coatings specializes in delivering the highest quality roofing products and systems to meet your needs. We have two different roofing systems that provide exceptional roofing insulation: AcryPly-D™ for new construction and AcryShield SPF Roofing System for new construction or roof restoration. 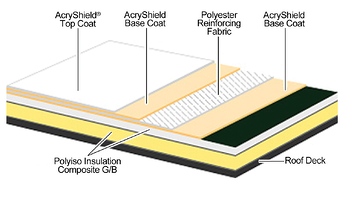 The All Acrylic Polyiso Insulation AcryPly-D Deck Up roofing system provides a durable, leak-free weatherproofing membrane with advanced UV protection. This roofing system offers exceptional insulation R-values and has the highest per inch Long-Term Thermal Resistance (LTTR) values. The LTTR represents an advanced scientific method based on the consensus standard in the United States and Canada for providing test results with a 15-year time-weighted average LTTR. Therefore, the AcryPly-D Deck Up System’s thermal performance is proven to provide superior energy efficiency while being cost-effective. Click here for more information regarding our AcryPly-D Deck Up System. The AcryShield SPF Roofing System is excellent for a new construction project or for roof restoration. This system allows you to restore your existing roof into a brand new fully warranted* roofing system without the need for a costly roof replacement. This system uses sprayed polyurethane foam to provide custom insulation to the roof while delivering a monolithic, closed cell-waterproofing layer over the entire roof field. SPF is excellent for providing exceptional roofing insulation because it is spray applied and can be built-up to provide additional insulation while creating custom slopes to prevent ponded water and eliminate drainage issues. For more information regarding our AcryShield SPF Roofing System, download our brochure for free. Having great roofing insulation is important because the insulation prohibits heat and cold transfer from being released outside of the building. This can drastically save you money on energy consumption for cooling and heating your building while promoting increased comfort for the building occupants. The insulation improves energy efficiency and promotes a cleaner environment. National Coatings is dedicated to helping you with your roofing issues. Give us a call 800-423-9557 and learn more about how our AcryPly-D and AcryShield SPF Roofing System can solve your roofing insulation needs.